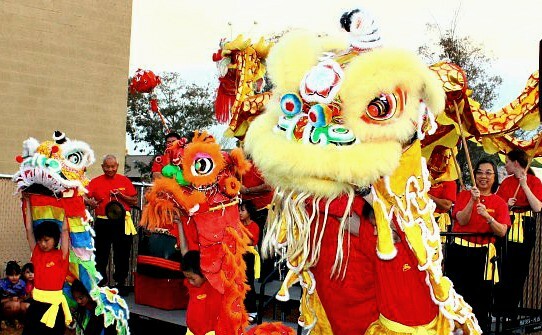 Because TIA embraces and delights in various cultural events, it is one of the places you can count on a Chinese New Year celebration in Tucson. Gabriella ran into the house after school and breathlessly announced, “Mom! There was a dancing dragon on the playground today!” Gabriella’s mom might have suspected her tiny daughter with the huge imagination was telling a tall tale if she attended school anywhere other than Tucson International Academy. At TIA, dancing dragons on the playground are very possible! In fact, with Chinese New Year occurring this week, dancing-dragon-crossing signs could be placed all around the school! Chinese New Year celebrations, also known as the Spring Festival, start on the 23rd day of the 12th lunar month of the Chinese calendar. In China, the holiday is the most important social and economic event of the year, traditionally linked to honoring the household, heavenly gods and ancestors. Today, China celebrates Jan. 1 as New Year’s Day, but the country continues to mark the Spring Festival as a time to spend with family and relax from work. The festival lasts from 15-23 days. The event is celebrated on a different day each year since the Chinese calendar is “luni-solar” which takes into account both the earth’s and moon’s movements. The Chinese New Year for 2015 began on February 19 and marked the start of the year of the Goat. Each year corresponds to a different zodiac sign and animal. The Chinese zodiac consists of 12 animals that denote a person’s birth known as shengxiao: rat, ox, tiger, rabbit, dragon, snake, horse, goat, monkey, rooster, dog and pig. Each of the animals is named after one favored by the Buddha and is said to influence an individual’s personality. For example, people born in a year of the Goat are generally believed to be gentle, mild-mannered, shy, stable, sympathetic, amicable, and brimming with a strong sense of kindheartedness and justice. How do People in China Celebrate Chinese New Year? Many people clean their homes to welcome the Spring Festival. Families tend to clean their homes in the days leading up to the celebration but all dusters and brooms are hidden during the holiday so that “good luck cannot be swept away.” The holiday itself is usually spent with family, shopping, watching fireworks, and in some cases, involves a religious ceremony honoring heaven, earth, and other deities. They put up red posters with poetic verses on their doors, Chinese New Year pictures on their walls, and decorate their homes with red lanterns. In the evening of the Spring Festival Eve, many people set off fireworks and firecrackers, hoping to cast away any bad luck and bring forth good luck. Children often receive “luck” money. Many people wear new clothes and send Chinese New Year greetings to each other. Various activities such as beating drums and striking gongs, as well as dragon and lion dances, are all part of the Spring Festival festivities. According to historical documents, on the day when Shun, who was one of ancient China’s mythological emperors, came to the throne more than 4000 years ago, he led his ministers to worship heaven and earth. From then on, that day was regarded as the first day of the first lunar month in the Chinese calendar. This is the basic origin of Chinese New Year. China adopted the Gregorian calendar in 1911, so Chinese New Year was renamed the Spring Festival. The red poster with poetic verses was initially a type of amulet, but now it simply means good fortune and joy. Various Chinese New Year symbols express different meanings. For example, an image of a fish symbolizes “having more than one needs every year”. A firecracker symbolizes “good luck in the coming year”. The festival lanterns symbolize “pursuing the bright and the beautiful”. Let us bring the world to your child and your child to the world. Maybe they’ll see a dancing dragon!